Grinding coffee beans with consistency is key for a great cup of coffee. Without it, the full flavor won't be released from the beans. With an attractive design, the Kitchenaid burr grinder may be just what you need. It features various grind adjustments to give you consistency and sturdy enough for most home kitchens. In this Kitchenaid grinder review we will cover features, specifications and potential issues to help answer some of your top questions about this coffee grinder model. There are 15 different grind settings available on this unit. This covers more than enough sizes for most coffee drinkers. You can create grinds for a regular cup of coffee to a fine grind espresso for the famous Flat White. The Kitchenaid Pro Line Series Burr Coffee Mill will conveniently grind different types of coffee from different areas around the world, such as Arabic, Turkish, and more. As long as you select the right grind adjustment for the drink you want to make, the unit will do the job. The amount of time needed for the grinder to grind one cup of coffee beans depends on how coarse or fine you want them to turn out. Expect the Kitchenaid Pro Line Series Burr Coffee Mill to grind one cup of coffee beans in under one minute. Can You Grind Spices Or Herbs?​ No! Utilizing this Kitchenaid Proline Grinder for chopping spices, herbs and nutmeg is not recommended. The grinding burrs of the machine have been specifically designed to cut through coffee beans. The unit produces a loud noise while grinding coffee beans especially when the grinder spins faster as it clears out the final beans. There isn't a grinder out there that doesn't make noise. We estimate it can reach up to 85 decibels. By comparison, a circular saw measures between 90 and 100 decibels and a back hoe measures 85 to 95 decibels. The hopper will comfortably hold 200 grams of coffee beans, which is equal to 12 pots of coffee. You can produce up to 15 pots of coffee at a time without any ground coffee flowing out of the carafe. The grinder does not have a handle for the coffee carafe, which can make it quite difficult to pick up once the beans are done grinding. Unless you have larger hands, you will not be able to grab the carafe with one hand. Probably one of the most common issues is the breaking of the coffee carafe. It is made of thin glass and needs to be handled with extreme care. Luckily, Kitchenaid allows users to buy replacements in the event that this happens. Here is a link to the Carafe. 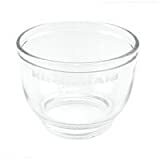 In the event you break the carafe, you can use a 1 cup Pyrex measuring cup. This will be sturdy enough to catch the grounded beans and it has a handle. Contact Kitchenaid Customer Service for carafe and grinding burr replacements in the event that they break during use. Of course these come at a cost plus shipping, if available. Like all coffee grinders, cleaning is required to keep the grinder in good shape. Otherwise you may get a poor grind or no grind at all. Taking the grinding burrs out of the machine to properly clean them is a time-consuming process. The Kitchenaid Pro Line Series Burr Coffee Mill ships with a complete instruction manual that covers all important information users need to know in order to correctly operate the unit. Final Thoughts: Should You Buy The Kitchenaid Pro Line Series Coffee Mill? If you are looking for a compact coffee grinder that takes little space on your countertop, then the Kitchenaid Coffee Grinder might not be the best option for you. The design is a little bulky and quite heavy. However, the unit feels sturdy unlike some of its competitors. The build of the unit and sturdy design may allow it to last longer than most models. There are 15 grind adjustments available from very coarse to fine. 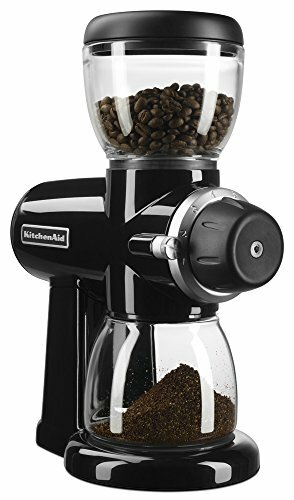 The KitchenAid Pro Line Series Burr Coffee Mill provides a consistent grind with large simple controls and a large coffee carafe. Manufacturered by a reputable brand. The body of the grinder is made of sturdy metal, but the coffee carafe is made of thin glass that is easily breakable. The coffee bean container does not have a handle. Some beans may not be emptied from the hopper because of its shape. Kitchenaid Pro Line Series Burr Coffee Mill may be out of your budget. Despite some of its flaws, the KitchenAid Burr Coffee Mill is one of the few coffee grinders to do its job well. Its performance, grind options, and ease of use does not require a rocket scientist to operate. However, it does all come at a price. My second Kitchenaid pro line grinder has failed like the first one. The first one lasted about two years, and this second one about 17 months. I took it apart and found the nylon planetary gears mounted to the motor end had broken and stripped teeth; same as the first machine. Very disappointed. They are far from the most expensive coffee grinders but still not exactly cheap. I grind enough coffee for a morning espresso and and afternoon espresso daily. Not really that much so just getting 17 months to two years from the machine kind of makes it a waste of money. That’s the con here, the pro is that when it was working it worked well, producing a nice proper grind for espresso machine use. Oh Carlo! Sorry to hear about your experience. Have you tried another grinder that lasts longer with a good grind?